Walk through the big glass doors at the Oregon Humane Society (OHS) in northeast Portland and you enter a stylish room with vaulted ceilings and polished floors. It feels like the lobby of a nice hotel until you look to the left and see the Robotic Cat Playroom. A glass-walled space full of cat toys that are wired to move, the playroom hosts groups of cats on a one-day trip to kitty Las Vegas. Behind the scenes, cat-lovers from around the country are using the internet to control the spinning neon fuzzy tails and bouncing doo-dads while watching the ensuing mayhem through a webcam. The Robotic Cat Playroom is just one of the many impressive features at the OHS, which takes in nearly 1,000 animals every month. Almost one third of those come from other shelters on the west coast who do not have the resources to keep them. With this many animals to save, it is astounding that the OHS has a 98% adoption rate. None of this would be possible without the work of more than a thousand volunteers who do everything from foster care to running with dogs. Another piece of this highly successful animal welfare organization is the Animal Medical Learning Center (AMLC). 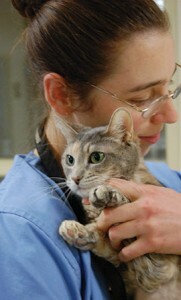 Half the animals that arrive at OHS need spay or neuter surgery, and a significant number need medical care. The AMLC is a unique partnership between Oregon State University and the OHS. In it’s high-tech surgery suite, fourth-year students from the College of Veterinary Medicine complete a two-week rotation as part of their graduation requirement. These extra pairs of hands help the shelter treat and heal pets faster, and reduce the average animal’s stay by 20 percent. It is also an invaluable real-world experience for the students. There is more to llamas than long eyelashes and a smug expression. They are surprisingly smart, friendly, and quirky. Llamas make excellent guards for herds of small animals. They are very social and will ‘adopt’ a group of sheep or goats as their own herd. Then they will protect the herd by chasing off coyotes and other predators. Llamas are smart. They can distinguish between the neighbor’s dog and a predatory coyote. Llamas are the camel’s hippie cousins. They belong to a group of animals called camelids that also includes alpacas. 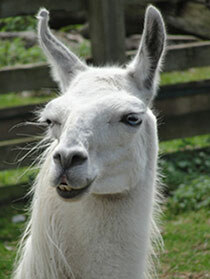 All camelids spit or stick out their tongue when they are annoyed. One of the ways llamas communicate is by humming. Llamas are diabetic — sort of. The OSU College of Veterinary Medicine (CVM) is using their herd of 30 llamas and alpacas to study how certain hormones affect blood sugar. Because the metabolism of llamas is very similar to that of a human diabetic, the results of this research may provide insight into human diabetes treatment. Pacemakers made for humans are adding years to dog’s lives thanks to an ingenious non-profit agency founded by OSU Professor David Sisson. Unsold human pacemakers that are past their shelf date and due to be thrown out can now be used in dogs. The Animal Companion Pacemaker Registry provides a clearing house for pacemaker manufacturers to donate the devices. 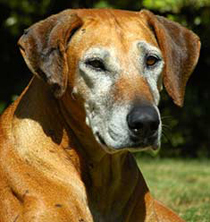 Veterinary cardiologists can go to the registry’s website and order them online. There are strict rules about how long pacemaker manufacturers can keep a unit sitting on the shelf; the lithium batteries eventually wear out and pacemakers in people often need to last for decades. But when you put a pacemaker in a 11-year old dog, it is okay if the battery dies in ten years. The medical devices are often implanted to speed up a slow heart rate in dogs with disorders such as heart block and sick sinus syndrome. A donated pacemaker from the registry costs about $500 compared to $5,000 or more for a brand new one. Sisson, who is head of the cardiology department at the OSU Veterinary Teaching Hospital, says several thousand dogs have gotten the lifesaving implants over the past two decades.